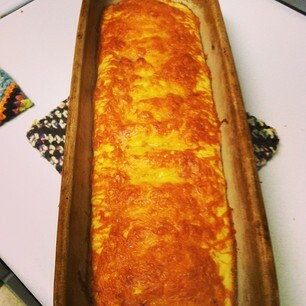 When I first did this recipe years ago (we are talking about early 1990's), I was not initially impressed. 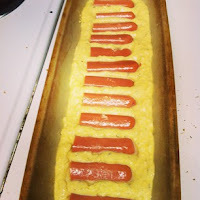 It is almost like a hotdogs immersed in corn bread, I am not a fan of corn bread so I was not crazy about this recipe.. So many years have passed and I make this recipe again, this time my family likes the recipe, so I will now occasionally make this recipe. This weak I found myself making it again. Combine dry ingredients, mix in the egg, milk, and butter. 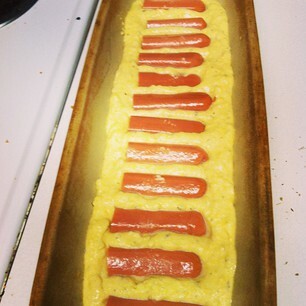 Add dough to greased 11 x 7 inch pan (I did mine in my favorite oblong bread pan), slightly press hot dogs evenly arranged in dough. cover with cheese. Bake in 400 degree oven for 25 minutes, or until the dough is done. Cut out and lift around the hot dog. 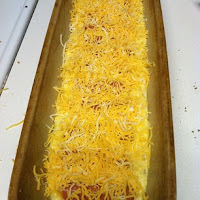 I just love corn dogs, and this looks like a fun, easier way to make them without all that frying. Thanks for the recipe!